That icon indicates to the user that this full mix has several alt versions associated to it. The example track in the screenshot above has 6 alt versions under the full mix. When a user clicks the "+6" icon, the alt mixes will expand right in place without leaving the page. The user can then preview/audition those alt versions right there in-page just like any other track on the site. You can nest your tracks in 3 easy ways. All methods require you to have all of your tracks uploaded and published to the site before you begin. 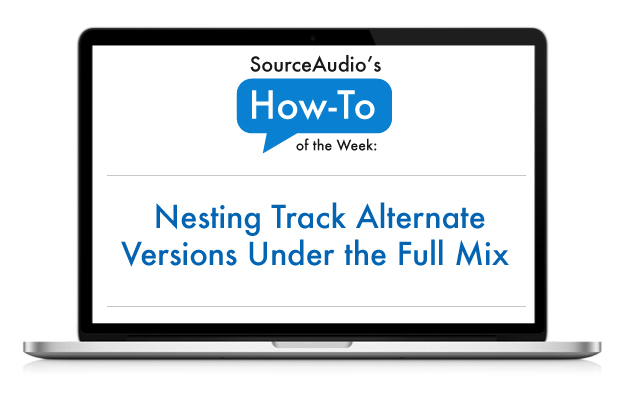 There isn't a way to nest during the upload process; nesting occurs only after your tracks are up on the site. 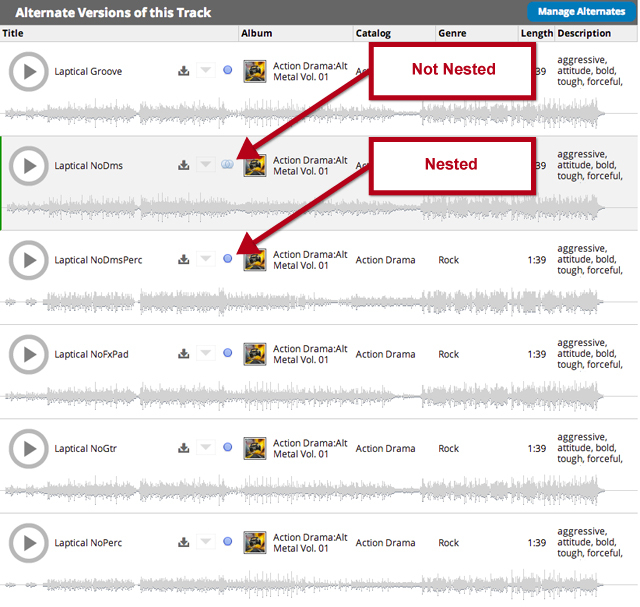 To use nest tracks using this option, just click on the title of the master version of the track you wish to start with as the full mix. Then click "Manage Alternates" down below the metadata to enable "nesting" mode on your site. Next, click the little blue overlapping circle icon next to the title to nest/un-nest the alt versions. You can cruise all over the site from page to page adding and removing alternates. When you're done nesting alt versions under the full mix, click "Done" at the top of your screen and you're finished. One thing to note: Nesting can take a few minutes to take effect on your site. We're writing these new nesting relationships to the cloud so please be patient and refresh after a few minutes to see your updates take effect. This option is more advanced. It's results also vary based on how you structure your song titles. The script is great, and it picks up most master/alt relationships, but it's not perfect because it can't account for every song title naming convention under the sun. Overall it's pretty darn good though. 1. You're trying to nest tracks that don't have the same filename and title pattern/convention. "Being close" unfortunately won't work because the software needs to recognize a consistent pattern in order for it to work properly. 2. You include the word "Full" or "Master" at the end of the full mix. That often triggers the script to think that this "Full" version of the track is actually an alt version because of the additional characters on the end. Make sure you leave "Full" and "Master" out of your filenames/titles and you're set. Lastly, you can always run the script and then you can use Option 1 above to go back in and perform any manual clean up that's needed. The script is great for nesting your whole site and the Manage Alternates tool is great for clean up and nesting smaller batches of tracks. To access this nesting tool, go to Admin Panel > Manage Metadata > Nesting and you can start nesting catalog by catalog. If you haven't attempted options 1 and 2, or you feel like they didn't get you the results you like, there is one last option that's guaranteed to get you the results you're looking for. Go into your Admin Panel > Manage Metadata > Export Data and export your track data to a csv. When you open the spreadsheet look for a column in there called "Master ID". In this Master ID column you'll include the SourceAudio ID of the full version each alt version belongs to. SourceAudio ID's are the 7 or 8 digit number in the first column on your spreadsheet. Simply paste the ID of the full mix into the Master ID column for each track that is an alt version of that full mix, save, import and you're set!